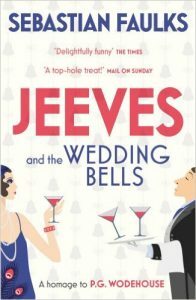 I first read Jeeves and the Wedding Bells by Sebastian Faulks a couple of years ago, when it was published amid a slew of well-known authors venturing into fanfiction. There was this by the award-winning Faulks, but also Emma by Alexander McCall Smith, (not to mention the rest of Austen’s titles reimagined as part of a wider project) new Sherlock Holmes titles by Anthony Horwitz, Death Comes to Pemberley by PD James, and more – each of which involved not just creating a fresh story, but imitation of the original author’s style. I have already blogged here about Longbourn by Jo Baker, and using others’ work as a jumping off point for your own inspiration. In this case, Faulks set out to write a new story about Bertie Wooster and his valet Jeeves, the duo created in 1919 by PG Wodehouse. And I’m fascinated by Faulks’ skilled mimicry. Pinpointing what works in an impersonation, and what doesn’t, is great practice at close reading. It encourages you to examine not just the language used by the original author but also the rhythm, and the manner of sentence construction. I find badly-chosen language is the first thing that jumps out. Elizabeth Bennet exclaiming, “Oh my God!” in casual conversation would leap from the page as something not found in the Austen originals. (Austen’s characters do say God at times – but the word is presented as “G-” when used as a curse, and only used otherwise in extreme circumstances.) Anachronistic language identifies a fake too – Dickensian characters ‘tuning out’ a boring conversation, or a Bronte heroine saying a carriage went ‘like the clappers’ – radio-related slang, and WW2 RAF slang respectively. So how can we writers use imitation to improve our craft? Different hats. As teenagers, we often try on different styles, different personas as we work out the kinds of adults we might become. I think as a writer it’s good to do the same, whether you’re a teenager or not. Try to be Dickens, or Austen, or Grisham or Child. Let’s face it, it would be pretty cool to be them, or maybe JK. So why not? Try on their styles. Mad mashups. These pieces are for practice. Clash together unlikely style and subject matter. Try sci-fi noir in the style of Brontë. Write a Georgian comedy of manners in the style of Chandler. Applying a style deliberately to unlikely content will also ensure that you are not copying these authors’ stories, only their execution. Elementary, my dear Watson. Mimicry is good for developing distinctive character voices, too. Fanfiction is great for this. When you need Spock to sound like Spock, it’s no good if he giggles and describes stuff as awesome. He has to use the right language, in the right rhythm, or it simply won’t convince the fans. Pick a fictional character you like and give them lines. What makes Mr Darcy distinctive? Try dry, restrained language, short sentences, drop in some signs of classical education. How would you know that it is Hermiine Granger speaking? Adopt a rather acidic tone, cut with earnestness, and use long sentences with impatient endings. Focusing on the capture of these distinctive characters gives you good experience when you come to check your own work. Do all your characters speak in the same way? How could a reader tell them apart without the dialogue tags? Sometimes watching TV you can tell if one character’s line had been given to another, to balance out the scene. It jars a little if the characters are well enough drawn. Listen for individual tics and habits. All these imitations feed into the creative decisions you make about your own work. Trying on other voices helps you become aware of your own. What style will you adopt? Jeeves and the Wedding Bells – a brand new Bertie Wooster story by Sebastian Faulks. The Austen project – contemporary authors reimagine Jane Austen’s classics. Sherlock Holmes – new stories in the original style, by Anthony Horwitz. Death Comes to Pemberley by PD James – what happened after Elizabeth and Darcy were married. How I write fanfiction – nine tips from me, for success in a very busy creative world.